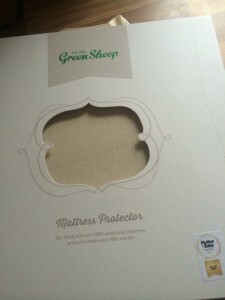 The lovely people at The Little Green Sheep (see here ) sent us a mattress protector to try out on the big man’s toddler bed. Anybody with a toilet trained toddler knows the importance of mattress protectors! Now, this is not just any mattress protector rather it’s an award winning product made from extra absorbent, luxury organic cotton and it is 100% waterproof. It really is super soft, there is a lovely texture to it. While I know this is not the key feature of a product, I do like practical products with nice packaging as I like to gift practical products to friends and family but like them to look pretty too. See picture opposite, packaging is lovely and id have no hesitation in gifting this to somebody as a new baby present. In terms of size for our cot bed, its absolutely perfect. What makes the fit so good on this is its flat against the mattress and not fitted which allows the mattress to breathe and also allows the fitted to sheet to still fit snugly over it. Due to this fit it also doesn’t pucker, another plus point and one excuse less for my toddler to use!! Its also not “crinkly” or noisy due to the lovely texture. The big question – does It actually work in terms of being as described – 100% waterproof. My toddler is toilet trained and dry at night time so we haven’t had any toilet accidents on it however we have just come out the other end of a horrible tummy bug. This protector got a tough trial in the Mamma Fairy house. I can happily attest to its functionality as it kept the mattress clean and dry despite numerous (and I mean numerous) vomiting episodes over the space of a few days. I have washed it a few times also since we got it and it has held up really well. I have found in the past mattress protectors can fall apart when washed, not the case with The Little Green Sheep. This retails at the higher end of the market at Stg£29.99 direct from their website. Admittedly it is on the pricier side, however you can’t fault the quality, functionality or the nice presentation. I will without doubt be purchasing again to gift to friends or family. Have you tried any of products by The Little Green Sheep? Would love to hear what you think. We love ours. We got one sent too.